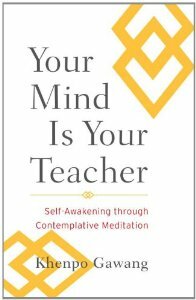 Available online and in bookstores, this concise handbook of Tibetan Buddhist teachings, designed for Western students, is centered on a sitting practice called Contemplative Meditation. This practice can be used as a way to change troublesome habits, even by someone with little knowledge of Buddhism. Although the teachings are based it on a nineteenth-century text by Lama Mipham, they are presented in a non-scholarly way, with examples drawn from modern life and everyday experience. In particular, the author addresses the unique attitudes and questions of twenty-first-century Westerners who are exploring Buddhism. The practice taught in the book consists of a reflection on four subjects, known as the Four Seals of the Buddha's teaching: multiplicity, impermanence, suffering, and emptiness. Khenpo Gawang Rinpoche explains how to investigate each of these topics in a way that helps you recognize your innate wisdom mind, which is your ultimate teacher. Once you learn how to examine your own mind and your life with this method, you will start to look at everything differently. By helping to dissolve negative thoughts and habits, the practice can increase your focus, confidence, self-esteem, and happiness. Finally, the appendix gives translations of two short readings: The Wheel of Analytical Meditation by Lama Mipham, which is the source of this book's teaching, and the Heart Sutra, a famous brief teaching on emptiness, along with a traditional commentary. Jeweled Lotus facilitates and publishes the writings and translations of Khenpo Gawang Rinpoche.